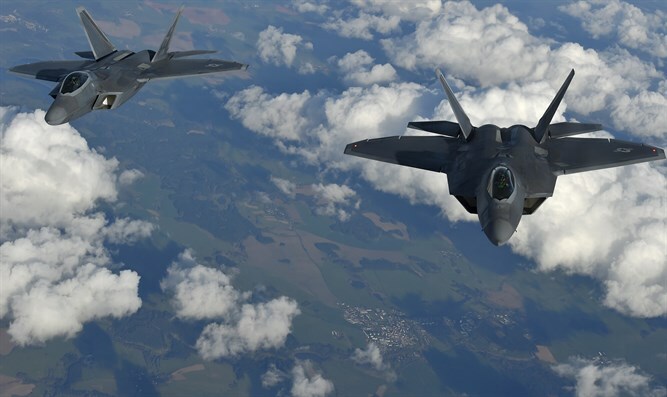 Annual U.S.-South Korean drill, called Vigilant Ace: Six F-22 Raptor stealth fighters deployed among more than 230 aircraft taking part. The United States and South Korea held large-scale joint aerial drills today (Monday), prompting North Korea to warn that the Korean peninsula would be brought to “the brink of nuclear war”. The drills were held despite calls from Russia and China to cancel them, reported Reuters. The drills come a week after North Korea said it had tested its most advanced intercontinental ballistic missile capable of reaching the US as part of a weapons program that it conducted in defiance of international sanctions. The North’s KCNA state news agency, citing a Foreign Ministry spokesman, said on Saturday the Trump administration was “begging for nuclear war by staging an extremely dangerous nuclear gamble on the Korean peninsula” while North Korea’s Committee for the Peaceful Reunification of the Country called U.S. President Donald Trump “insane” and said the drills would “push the already acute situation on the Korean peninsula to the brink of nuclear war”. China and Russia had proposed that the United States and South Korea stop major military exercises in exchange for North Korea halting its weapons programs. It has said its weapons programs are a necessary defense against U.S. invasion plans. The United States, which has 28,500 troops stationed in South Korea, a legacy of the 1950-53 Korean War, denies any such intention.